Jaime Stathis has been writing professionally since 2009. Her work has appeared on LIVESTRONG, eHow and Trails.com among others. She received a Bachelor of Arts in writing and rhetoric from William Smith College in 1996. She is working toward her Master of Fine Arts in creative non-fiction at the University of Montana. Because so many Americans diets are fiber-deficient, it is prudent not only to increase fiber in the diet, but also to periodically cleanse the colon. Cleansing the colon will detoxify the body, assist with weight management, lower cholesterol, balance blood sugar, aid regular digestion and elimination, remove toxins from the body, and improve overall health. Stock your kitchen with fiber-rich food. Some examples of foods with the greatest amount of fiber per serving are legumes, unrefined grains (oats, brown rice and whole wheat), high-fiber fruit (apples, avocados, oranges, bananas, grapefruit berries), and high-fiber vegetables (spinach, endive, broccoli, carrots and cauliflower). Gradually add fiber to your diet. A fiber-rich diet has 20 to 35 grams of fiber a day, though many Americans eat half that amount. If you are regularly constipated or have been eating a fiber-depleted diet increase fiber slowly, about 5 additional grams a day until you reach 35 grams. Include pure psyllium husk powder into your diet to jump start your cleanse. As an alternative, you can purchase a psyllium-based cleanse product/kit, which will include other ingredients to aid cleansing, increase results of a fiber cleanse, and possibly taste better than pure psyllium husk powder. Start by taking 1 rounded teaspoon of psyllium husk powder once per day and see how it works. Take 1 rounded teaspoon one to three times per day for the greatest benefit. The powder can be mixed with juice, water, milk or any liquid. Keep in mind that it thickens whatever you add it to and also takes on a slightly gelatinous quality. You can also incorporate it into smoothies, stews, soups, breads and other foods. Psyllium is best taken 10 to 20 minutes before or after eating, but not at the same time as a meal. During a fiber cleanse with psyllium, you should drink extra fluids as the psyllium absorbs the extra moisture content of the bowels. Psyllium husk is completely plant based. If you don’t like incorporating the powder into your food and drink, you can also take psyllium husks in a capsule form though the maximum benefit will come from taking the powder. Listen to your body and take the amount of psyllium husk--powder or capsule--that feels right to you. 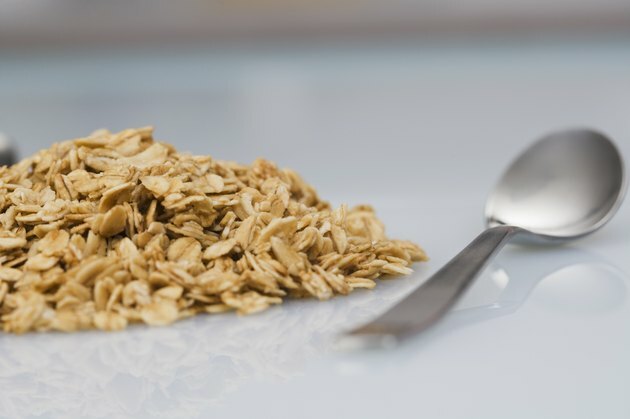 Pysyllium is non-toxic, all-natural and poses very little risk, but f you have excessive bowel movements or diarrhea, cut back on the amount of psyllium you are taking until you get to the right amount for your body. Pregnant women should not do a psyllium-based cleanse and should consult their doctors regarding changes to their diets. Does Too Much Fiber Cause Stomach Cramps?